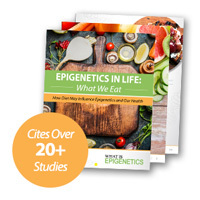 The Consequences of a Poor Diet Could Epigenetically Persist Despite Improving Eating Habits | What is Epigenetics? A majority of people know that improving your diet will lead to an improvement in your health. But not everyone knows that the consequences of eating poorly can actually persist even after you’ve changed your dietary habits for the better. New research on mice suggests that even following the treatment of atherosclerosis – the build-up of plaque in your arteries – by lowering blood cholesterol and improving diet, the detrimental effects of poor eating continues to affect the functioning of the immune system. This occurs because of the effect unhealthy lifestyle has on gene expression, which ends up keeping the risk of developing cardiovascular disease greater than it would have been if the diet contained no unhealthy foods. “I hope that this study demonstrates the importance of diet-induced changes in the epigenome and encourages further research into the interaction between dietary patterns, DNA methylation and disease,” said researcher Erik van Kampen from the Division of Biopharmaceutics at the Leiden Academic Centre for Drug Research at Leiden University in Leiden, The Netherlands. In the study recently published in the Journal of Leukocyte Biology, researchers assessed two groups of mice who had a greater susceptibility to high blood cholesterol and atherosclerosis. Each group was fed either a normal diet (chow) or a diet high in fat and cholesterol (Western-type diet). After an extended feeding period, the scientists isolated the mice’s bone marrow and transplanted it into mice with a similar genetic background. These recipient mice were given a diet of chow for several months and then the researchers measured the progression of atherosclerosis in the heart. They also measured the status and amount of immune cells in the body as well as the epigenetic markings on bone marrow DNA. Source: Learn all about it and read more about their findings here: E. van Kampen, A. Jaminon, T. J. C. van Berkel, M. Van Eck. Diet-induced (epigenetic) changes in bone marrow augment atherosclerosis. Journal of Leukocyte Biology, 2014; 96 (5): 833. References: Federation of American Societies for Experimental Biology. The effects of poor eating habits persist even after diet is improved. 2014.